Found my home. Dammit I just keep coming back to Lite. I love the little linux distro. Fits me like a glove. I feel like I am the master of my domain. Does anyone know what I'm saying? I Started Ubuntu 10.10 years ago and that was so disappointing. No not at the distro or even the Linux as an OS. I just had no clue what I was getting into. I think I broke it that same night. I was so clueless. Gone back to Win7 for a few more years and saw a youtube video and that peaked my interest again. By that time I was gonna trying Ubuntu 14.04 and this time after watching a few hundred bash and distro install videos I decided to give Ubuntu another go. This time I managed to keep it going for over a month with out breaking it. Unity was fun but I got sick of it fast. So I came across a few more reviews and found Linux Lite. I liked it and played with it a few days. Burnt me a CD and still wanted to see the others. Tried to install Open Suse and I think something went wrong and bailed. Went back to Lite. Few weeks later thought I try something else. Starting to figure this stuff out. 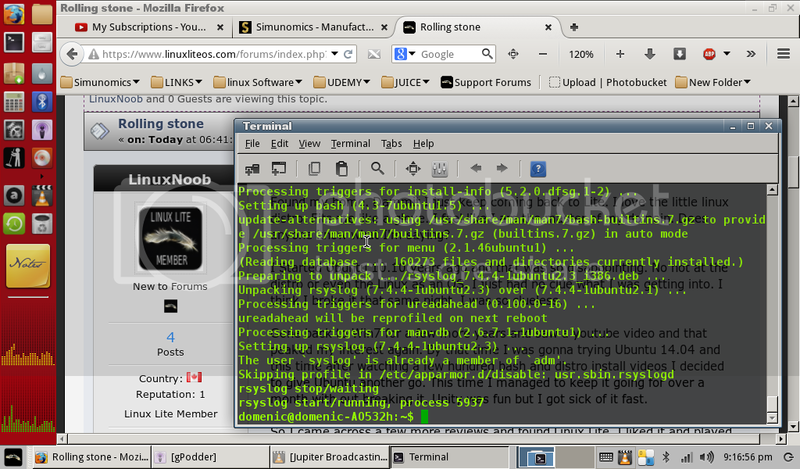 I tried Linux mint KDE and I liked it but so much eye candy and stuff to play with and adjust. I did not like the Activities thingy and the different types of desktops and all I wanted was to put icons on the desktop. So I bailed on that but kept the disk. Tried some Jeos and did not get far with that at all. Tried FreeBSD NOPE never even got it installed. I thought I should have to try Red Hat too but it seems like thats not a free distro. Back to Lite. Think I'll stay a while. Welcome to the forum and community. Thanks again everyone. My little Acer Aspire one lives again. Got her all set nice. Nice desktop. I like how you did the panel and the graphs.